With an Academy Award nomination for his scene-stealing role in Revolutionary Road (2008), Michael Shannon’s career was given a considerable boost. For years, he’s plugged away in small roles in big films like Pearl Harbor (2001) and more substantial parts in independent films like Grand Theft Parsons (2003). He’s one of those character actors that can bring an extra special something to the table with his unconventional looks and quirky acting style, much like Steve Buscemi did in the 1990s. So, when Shannon gets the chance to headline a film, as he does with The Missing Person (2009), it is definitely worth a look. “I coulda lied there forever, but the phone rang.” And with that bit of hard-boiled narration we are introduced to the world of private investigator John Rosow (Shannon), a rumpled burn out cut from the same cloth as Elliott Gould’s gumshoe in The Long Goodbye (1973). Rosow is hired by an attorney over the phone to tail a man (Wood) from Chicago to Los Angeles by train. Rosow may come across as a burn out but when it’s called for, he displays the necessary private eye skills: paying off a taxi cab driver to tail his target, pulling a fast one on the hotel clerk where the man is staying at, and listening in on the man’s room. Rosow eventually finds out that there is much more to this mystery man than meets the eye and that there is much more to the job than he was initially led to believe. Halfway through the film, the story veers off in an unexpected direction that gives the film noir genre an interesting spin as we gain significant insight into both Rosow and the man he is following. Without giving too much away, we begin to realize that the film’s title applies not only to Rosow’s target but to the private eye himself. 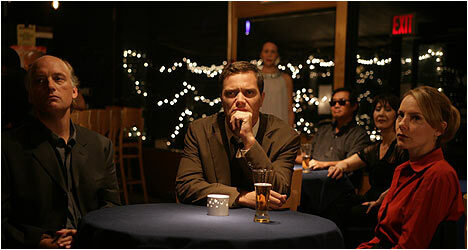 Writer/director Noah Buschel makes good use of Michael Shannon’s world-weary face. Rosow seems to sport a permanent grimace as if every action were a painful chore. It doesn’t help that he appears to be a barely functioning alcoholic. Over the course of the film, it becomes apparent that he is haunted by memories of his past that come to him in his dreams. Through several flashbacks, Buschel hints at a happier time for Rosow when he was involved with a beautiful woman that was probably his wife. Shannon doesn’t overplay his character’s affectations but does make one aware of them by the way he carries himself and through body language. While Chicago is photographed by cinematographer Ryan Samul to look drab and drained of color, L.A. is sunny and vibrant so that Rosow, with his plain brown suit, looks out of place. Like Gould’s P.I. in The Long Goodbye, Rosow is a man out of time. He listens to music from the 1950s and dresses like a gumshoe from the 1940s which is rather fitting seeing as how Shannon looks like an actor who could’ve had a pretty good career appearing in film noirs from that era. Shannon is fascinating to watch and is an actor that makes interesting choices when it comes to a given scene. The world weary private eye genre has been done to death but Shannon, along with Buschel’s excellent writing, keeps us engaged for the entire running time of The Missing Person.